R & D in 2012 sixth generation Touchwin2.0 (MD20H) high throughput microwave digestion system. APL brings a remarkable intelligence and ease of use to microwave sample preparation with the Touchwin Microwave Reaction System. 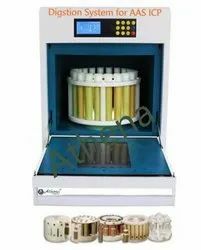 It offers unsurpassed versatility for microwave-assisted chemistry and may be configured for digestion, extraction, synthesis, or as a combination digestion/ extraction system. 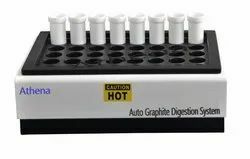 Athena's most well-known manufacturer of pre-treatment instruments, Athena, is proud to introduce a 20-60 smart graphite digestion device to meet the needs of large-scale sample preparation of AAS and ICP equipment! The heating area is made of graphite protected by Teflon. It Provides clean, economical, efficient digestions. They can accommodate up to 100ml graduated tubes and can operate from ambient temperature to 250 ֯C. Which is good for the sample pretreatment for the analyses by AA, ICP, ICP-MS etc. Double channel automatic Liquid system: according to the experimental requirements for automatic liquid, can be achieved by L, ml or slightly large capacity or trace precise automatic liquid, liquid coefficient can be set arbitrarily the precision is 1%. APL offers a large selection of vessels in a variety of sizes and materials including Teflon, glass, or quartz for a broad range of organic and inorganic samples to ensure complete digestions. · EPA method for soil treatment: 3010a, 3010b, 3050b, 3060, etc. · EPA method for water treatment; 2002.2 , 200.7, 200.8, 200.9, 245.1, 365.1, etc. · Electronic product processing methods: SJ/11365-2006, etc. · Coating treatment GB method: GB/T22788-2008, etc. · Soil treatment GB method: GB/T22105.1-2008, GB/T22105.2-2008, GB/T22105.3-2008, etc. · Food processing GB method GB/T17138 -1997, GB/T5009.11-2003, GB/T5009.17-1996, etc. Looking for Graphite Microwave Digestion System ?